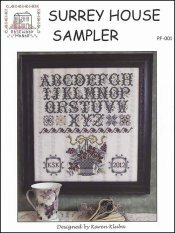 Surrey House Sampler [K7069] - $13.00 : Yarn Tree, Your wholesale source for cross stitch supplies. A sampler with multiple different flowers. Stitched on 28ct Linen. Stitch count 165 x 177.